From construction to engineering companies, a wide range of businesses require the use of health, safety and environmental policies. Unfortunately, the employees don’t always have direct access to these policies, or they must go into the office to make a complaint or report. Therefore, a mobile app solves many of these problems, considering your employees can place an app on their phones and use it on the field or while on the go. We evaluated several organizations taking advantage of iBuildApp for this purpose, and discovered that these are some of the most eye-catching, and functional, apps in our library. 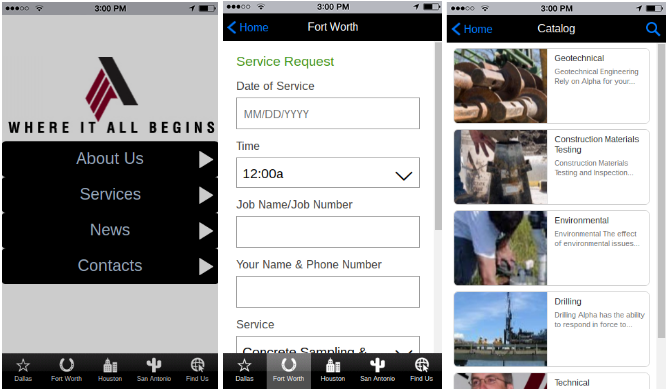 Continue on to view some of the best examples of company apps with environmental, public safety and health information. 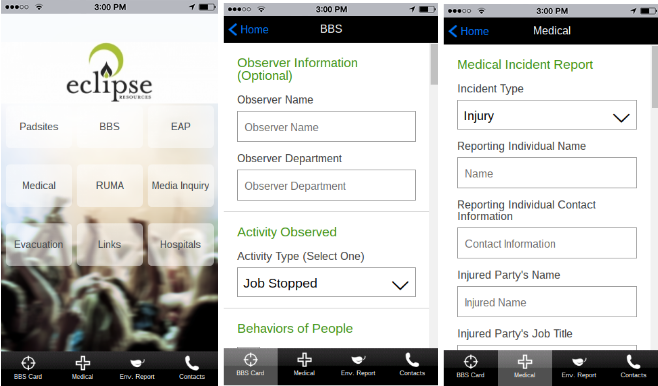 Take note of the benefits and features (like emergency contacts, incident reports, hazardous material disclosures and safety instructions,) and consider generating your own internal app for the same purpose. What is Their Intended Audience? 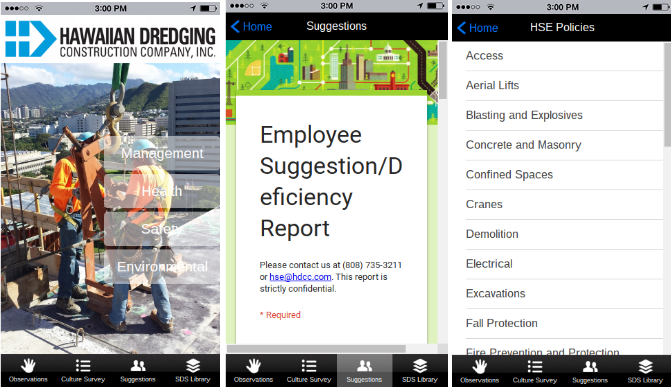 This app delivers content to the employees of the Hawaiian Dredging Construction Company, making the workforce more mobile and allowing for employees to address health, safety and environmental issues while in the field. Which App Features Do They Use? The HDCC app provides a beautiful homepage, with links to HSE policy videos, observations, HSE program content and direct contact to the HSE department. Therefore, employees are constantly connected, they can view policies and they don’t have to think twice about where they need to go to make a complaint or give feedback. Alpha Testing uses this app to manage four offices with 500 employees. The app provides support for employees and customers, where the marketing coordinator offers tools and features for geotechnical engineering, construction materials and environmental information. The app shows contacts from all of the offices in the organization. It also has Vice President contact information, along with news, services and a beautiful form for requesting information from each office. Finally, the app includes a Find Us section with a map, which would most likely be used by customers or new employees. The primary reason this app exists is to connect internal employees with HR and the corporate office. In fact, the app download page states that employees must contact HR in order to get access to a download link. It’s clear that the environmental director manages the app for the chemical research and industrial equipment company. Eclipse Resources has the app for a wide range of reasons. For example, the company utilizes a few of the pages for sharing emergency contacts. They also have an action plan, medical incident report, safety instructions and a environmental submission form to report problems in the field. 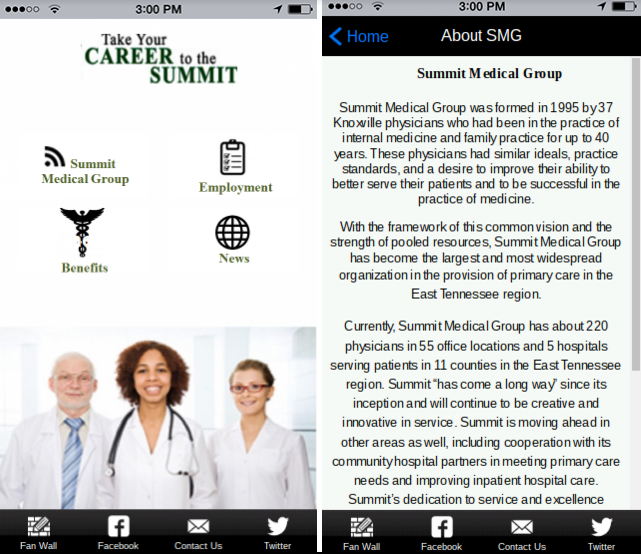 The Summit Medical Group app targets customers and potential employees, considering it’s more of an informational app for the chemical research and industrial equipment company. For example, one of the buttons is primarily for employment, and it’s clear that either the HR department manages the app. An About Us page gets the app started. You can then go to several pictures and a fan wall for live chatting with people in the organization. Some of the other app pages include options for videos, events, Twitter, Facebook and more. We also like that the app provides tabs for contacting the company and finding the locations. 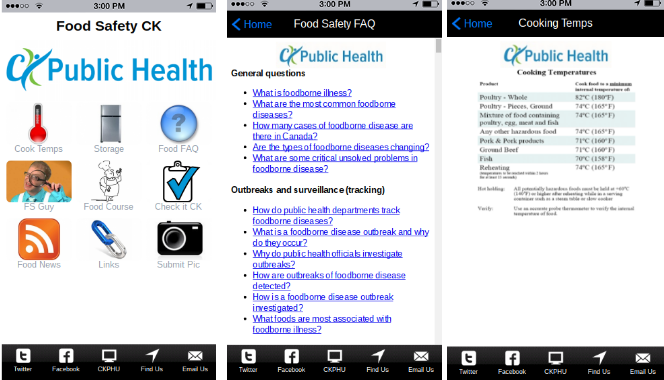 The Food Safety CK app provides information to the public. It’s primary function is to educate people with information regarding food inspections. For example, this could apply to the following organizations: Food businesses, recreational water facilities, day cares and recreational camps. The app details food safety information such as safe food handling practices. You can also find food safety regulations and a link to course registration for learning how to properly handle food. Could Your Company Use an Environment, Safety or Health App? If your company needs to give your employees a way to report health, environmental or safety problems in the field, we recommend browsing through these examples to see exactly how it’s done. All of the apps listed above present simple tools offered through iBuildApp. Therefore, it only takes a few minutes to get setup for a much easier reporting and communications process in your organization. If you have any questions about the apps, feel free to leave us a comment in the section below. Designing – in the truest sense – is a universal language that goes beyond the barriers of conventional modes of communication. Our designing creativity takes the aspect of interaction a step further that makes understanding more lucid.At the end we are proffer you digital marketing & seo. We also provide a wide range of services that mostly revolve around web designing and developmnt,graphic designing and App development. Great post, I really like the way you layout the format of the post. And, thank you for sharing all the tools and resources from the conference. Nice collection of data. Your blog post is really good. These tips are very useful for digital marketers.